This paint is the best chrome you can get. 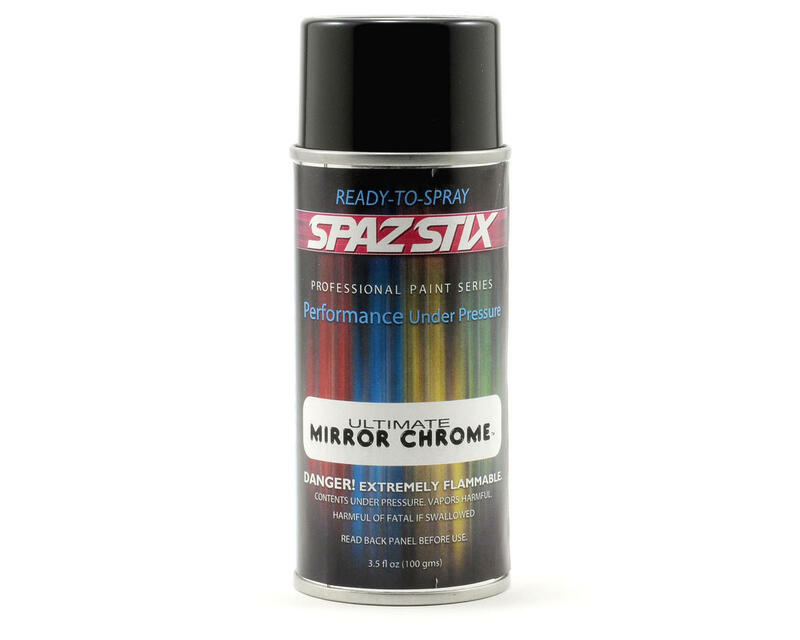 You must use the spaz stix mirror chrome clear backer to do it right. Spray ultra light coats and allow to dry between each coat. Thinner the better for durability. Don't scuff the body and make sure body is lint free. Enjoy! I've used this product exclusively for several years now. There is simply not a better chrome product on the market. Alclad is a distant second. Get this in the aerosol can put 3 medium coats and back with opaque gray and this stuff is amazing. The people that have issues with this product must not be familiar with chrome paints. In addition, I've never needed to use the surface prep. Awesome!!! I followed the directions as per the can, used the pre-prep, and mirror chrome backing paint. After trimming out the body, it appeared as though I had been on a date with a stripper since there were flakes of chrome everywhere. Chrome continued to flake-off and came off in chunks upon making contact with anything. It looks great, but since it flakes-off almost completely, I don't think I could recommend this to anyone who races off-road. It may be OK for on-road/VTA type racing. Again, looks great, but won't stay on the body. so i used this paint to line the design on my jconcepts ford raptor body for my sc10 4x4 body came out amazing the paint just popped and i did all the pre prep stuff it said to do for it. Im not even kiddding two runs at sdrc with this car the chrome is flacking off like crazy i mean im not even crashing all the time over shoot a jump just a little with not even to ruff a landing and guess what you can see chucks flying off every where its so dumb i spent all that time painting this body to have streaks of clear all over my body. no possible if u back the pain with shoe-guu it might stay but then your body is super heavy so im sstaying away from it from now on.